A consultation on the future of the Association of Colleges has set out plans for an overhaul of membership fees, to help prevent a £1 million overspend on its 2017/18 budget. The document was unveiled this morning as AoC chief executive David Hughes admitted to FE Week that it needs to reform to balance the books – in part because membership numbers are set to drop with widescale college mergers. It currently has 308 members. But he still insisted there are no plans to scale back its operations. Speaking to FE Week he said: “We represent almost 100 per cent of the eligible colleges, who deal with three million learners and what they want is a professional organisation to represent their interests, and provide them with support. 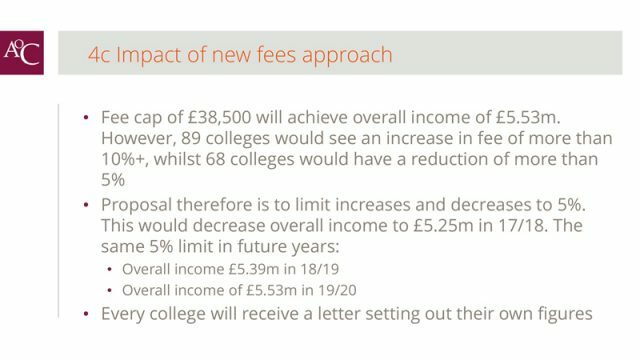 The consultation with members proposes reducing the rebate for largest colleges, “as mergers reduce college numbers”. 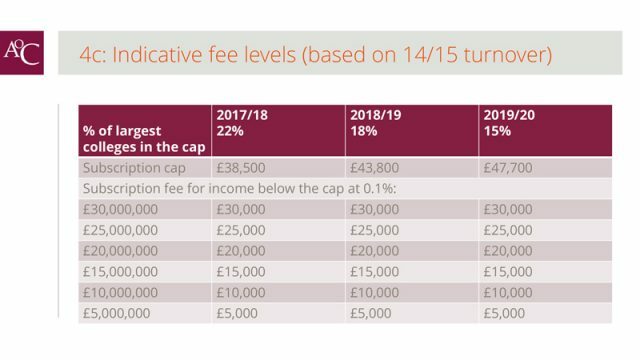 The proposal is for a new AoC membership fee structure “of a single fee per college set at 0.1 per cent of turnover with a reduced rebate for the largest colleges”. The document conceded that the current organisation is “not affordable” on fee levels, and “rolling forward as we are” would lead to a £1 million overspend on £6 million budget in 2017/18. A fee cap of £38,500 would achieve overall income of £5.53 million, the document explained. However, 89 colleges would see an increase in fee of more than 10 per cent, whilst 68 colleges would have a reduction of more than 5 per cent. 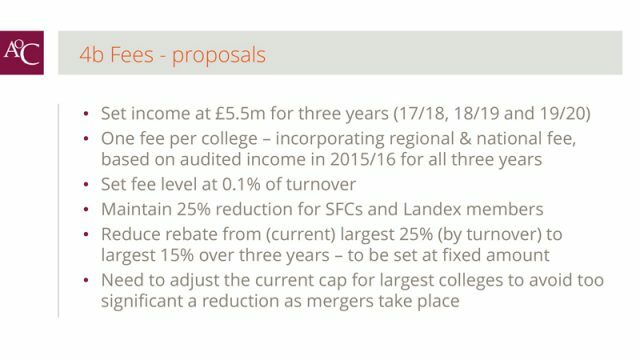 The proposal therefore “is to limit increases and decreases to 5 per cent”, which would decrease overall income to £5.25m in 17/18 (see proposals from the consultation document below). Mr Hughes explained any decision on future fees will be made by the board, having considered the consultation response. “Most boards try to reach a compromise that everyone is happy with and that is what we’ll do,” he explained. Mr Hughes added: “If we did nothing we would probably overspend by £1 million. “It is down to a combination of things. The number of mergers that will happen will mean that our income will go down considerably over the next three years. He said it would be “interesting” to see how people will respond to the consultation. “We had to propose something for fees because members were saying very clearly ‘we don’t want to keep cutting AoC, we want it to be effective’. This proposal tries to strike a balance. AoC is also looking at rationalising its regional structure, as previously discussed with FE Week. It currently has nine regional offices, which Mr Hughes explained could go down to “five maybe six”, with a new person possibly in place nationally to lead regional team. Three of the current regional arms are external, contracted partners (EMFEC, ACER, AoSEC). When asked what might happen to them, Mr Hughes said: “We are not trying to cut them loose or undermine them. We are trying to see how can we make this work. 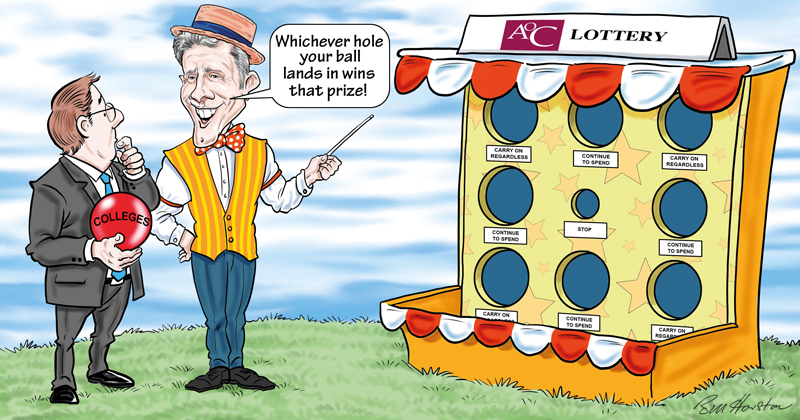 Mr Hughes added his organisation will be “consulting but not quite as formally” on commercial arm AoC Create and other subsidiaries over the next year. I wonder how much a WC1 office and an associated parking space for the ‘Chief Executive’ costs?